The BlackBerry Torch lights up the smartphone showdown with a functionality that's all business. Research in Motion apparently is getting tired of giving up all the style points to the iPhones and Droids of the world. 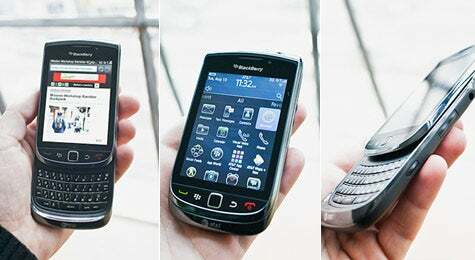 The BlackBerry Torch 9800 is RIM's attempt to stay relevant in the small-business smartphone discussion. At less than 6 ounces and an inch taller than a deck of cards, this so-called "slider" (the qwerty keyboard slides in behind the screen that's just over 3 inches) features the app-friendly BlackBerry 6 operating system. Though the unit can't, well, touch the iPhone 4 or Motorola's Droid for touch-based interactivity, it's great for keyboard-based work like e-mail. And the interface, controls, camera, multimedia functions, Wi-Fi and battery life are excellent. The Torch ($199 with a two-year plan from AT&T) comes installed with the BlackBerry App World access software, which offers a few hundred productivity apps--not enough to do battle with the Apple App Store or Android Market. But--and Microsoft Exchange users take note--RIM now gives away its Enterprise Server Express software tool on the company website, letting users sync their phone to their desktop for free. Server Express allows for small-group collaboration for companies that e-mail, calendar and collaborate within the Microsoft Exchange world. That alone makes the phone a serious business contender. Bottom line: For small groups looking to work on a phone with a keyboard, the Torch is a high-quality option. Plus, it looks pretty darn nice coming out of your pocket.